Early sneakers were initially designed for elite athletes, but kids and teens quickly adopted them. Some of the first brands included Converse, Brooks, and Saucony. German companies Adidas and Puma started up during World War II. The Nike shoe debuted in the 1970s (with a bit of inspiration from a waffle iron). As fitness crazes took off in the 1980s, people all over the world started buying the shoes for workouts and everyday wear. At about the same time, companies began hiring high-profile athletes and pop stars for big-dollar endorsements, and shoe sales soared into the stratosphere to the tune of billions of dollars each year. In Sneaker Century, follow sneaker fashions and the larger-than-life personalities behind the best known athletic shoe brands in history. Learn how teen sneakerheads became important style makers and drove the success of NIKE, Inc., and other shoe companies. Look behind the scenes at the labor-intensive process of manufacturing sneakers. Explore the sneaker frontier of the future—recycled shoes, earth-friendly initiatives, and high-fashion statements. 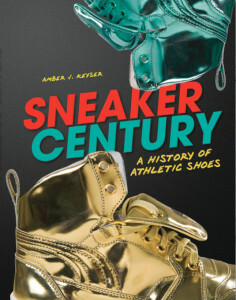 Get ready to speed through the Sneaker Century!